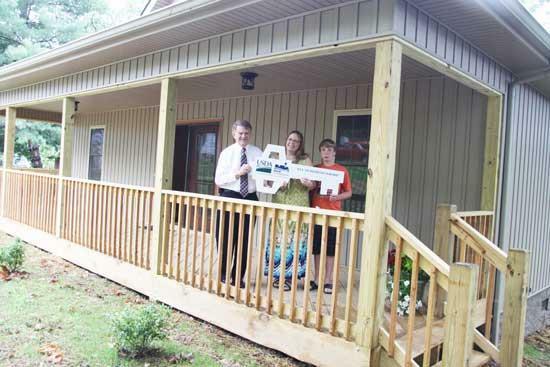 The Cookeville Area Office of USDA Rural Development celebrated National Homeownership Month by presenting the key to a new dwelling to Tammy Barnes Tuesday (June 28). Her new home was financed by a Rural Development Single Family Housing Loan. On hand for the ceremony was, from left, Larry Harkleroad, area specialist with the USDA, Tammy Barnes and Cole Barnes. Rural Development loans may be made without a down payment and eligible applicants may qualify for loan financing up to 100 percent of the appraised value. For more information on Rural Development Programs in Cannon County, contact the Rural Development Area Office in Cookeville, 931-528-6539, ext. 112.